My heart instantly warms when I look down at my ringing phone and see the name, Linda Benson. From the first time I met her, Linda has held a dear place in my heart and the feeling has only grown stronger over the years. She taught my son to surf, gave me some of my first photo opportunities, spoke on TV cameras on my behalf, and has had my back on several occasions. When her voice on the phone told me of a secret mission she had planned, I was beyond honored by her call. 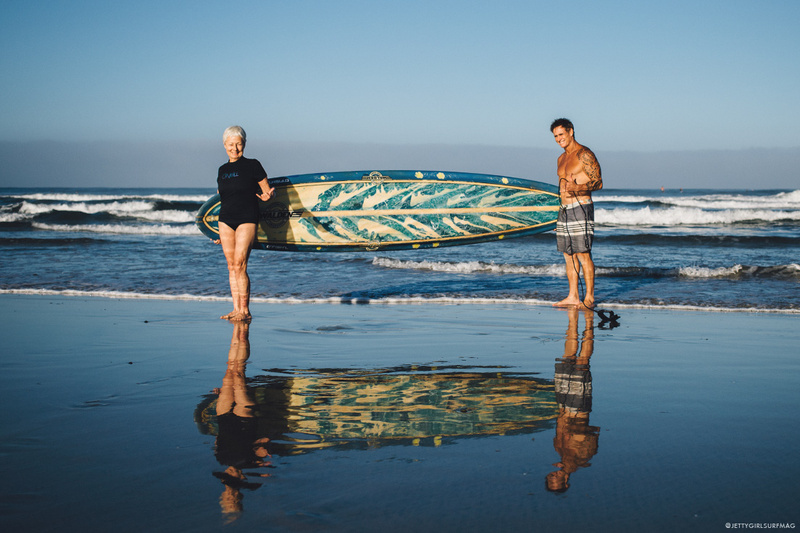 Her mission was to go tandem surfing for the first time in fifty years and she wondered if I'd like to snap a few photos of the session. Teaming up with tandem surfing legend, Bobby Friedman, the day finally arrived and after some practice lifts on the beach, the two surfers were out in the water giving it a go. While this session may not be written about in the history books like some of her previous surfing accomplishments, to the few of us who were there to witness the feat, it was utterly amazing. Seventy-one years young and performing like she did in windy, challenging conditions is something I will never forget. Thank you to Linda and Bobby for giving me the opportunity to share in this special day. JettyGirl: How did this tandem session with Bobby Friedman come about? Linda Benson: I've known Bobby for a long time. About ten years ago he started asking me to tandem with him and I always said, "We'll do it." Truth be known, I never really planned on doing it until a few weeks ago and I just thought, why not? I had always told him he was the only one I'd trust enough and that is the only reason I finally did it. Tell us your previous experience with tandem surfing. Any memorable moments from your sessions from five decades ago? 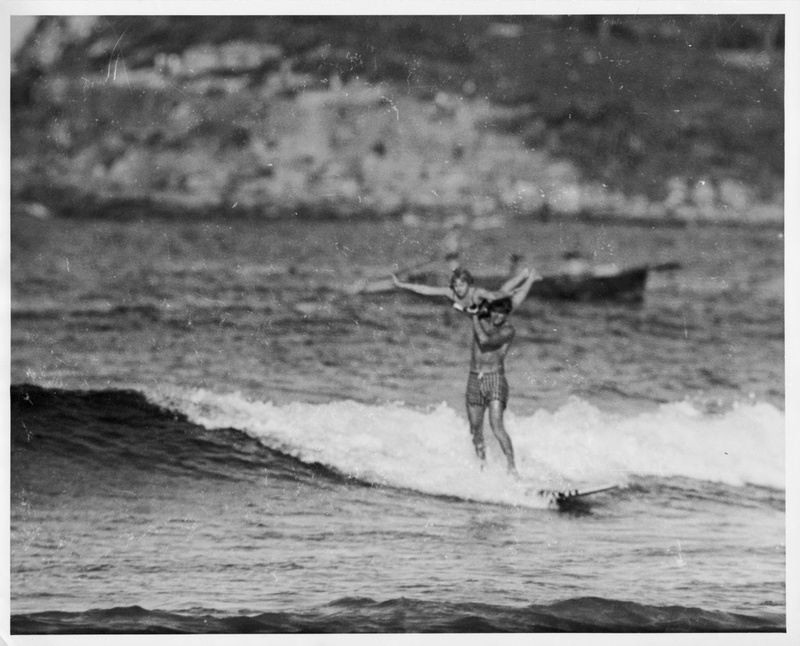 I first tandem surfed with Hobie in 1960 at Makaha and we got second to Mud Warner and Robin Gregg. I also partnered with Don Hansen in 1961 at the Huntington Beach contest. 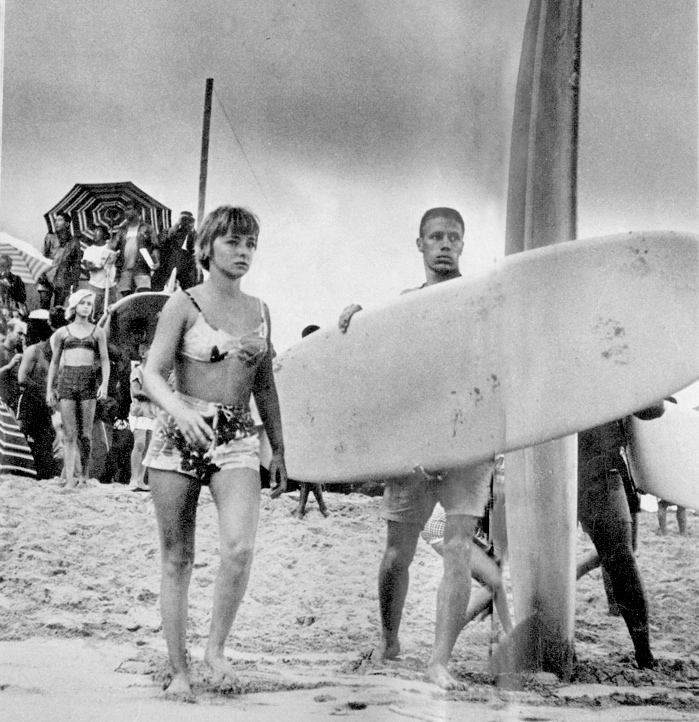 I also tandem surfed with Rusty Miller for one California contest in the early 60's. My last tandem surf was an exhibition with Mike Doyle at the World Surfing Championships at Manly Beach, Australia in 1964. Much in the way it’s somewhat difficult to ride on the back of a tandem bike, as an accomplished surfer it seems like it would be tough to relax and allow someone else to control the surfboard. Was it challenging to go along for the ride? In the early days of tandem, the guys and the girls really didn't have that much experience. We all just learned the tricks and winged it. I really wasn't very good at it. I have never been particularly limber or acrobatic. Another reason I wasn't good was that, because I surfed, I knew when we were heading for trouble. You can't really relax and hold a one legged swan pose when disaster is looming ahead :)!! That's why the best tandem girls didn't surf or try to bail when things looked bad... they didn't know any better. The other thing was that I always wanted to surf and not practice tandem. Looking back on your tandem session with Bobby, are there any particular moments (good, bad, scary, or otherwise) that stand out in your mind from the day? I trusted Bobby with all my heart, because of his vast experience and incredible surfing skills. Bobby has been competing in world class tandem events for years and is currently practicing for the world title. I knew I'd be okay no matter what. I really wanted to do okay for him and I prayed that I could and would. I didn't worry one bit about the wave. I knew Bobby had it covered. He also likes to just surf with a partner without doing any poses. Our first wave was a lined up Cardiff Reef right and he went to the bottom and then cranked it up and right off the lip... I didn't have any idea what we were doing or if we were going to make it, but I also knew I'd be okay. We landed that off the lip move and when we did, I looked down and saw my feet planted on the board and thought OMG. From then on it was impossible to wipe the smiles off our faces for the rest of the session!! Trust at the highest level!! It was a blast! !